A guy posts on Reddit with the username GabeNewellBellevue. People ask him to prove it's the man who runs one of gaming's biggest companies. The result: the picture you see above you. Backstory here is that Newell's backing a car competing in the Heart of Racing charity event. 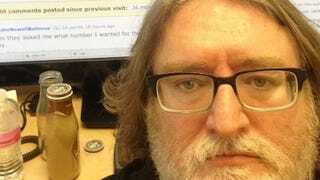 The head of Valve submitted a link to the popular r/Gaming sub-Reddit to get the word out. But, apparently, his link got no upvote love there. Thankfully, his submission got some traction on r/Motorsports, where he was asked to provide evidence that he was the guy who flips the switches on Steam sales. And the number that Gabe wanted on his very, very fast automobile? 3. Can't say the man's not self-aware.